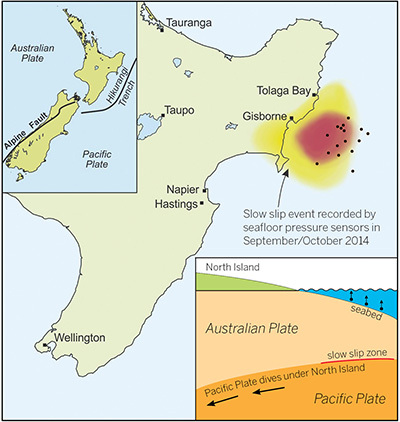 Research published in the May 6 issue of Science indicates that slow-motion earthquakes or “slow-slip events” can rupture the shallow portion of a fault that also moves in large, tsunami-generating earthquakes. The finding has important implications for assessing tsunami hazards. 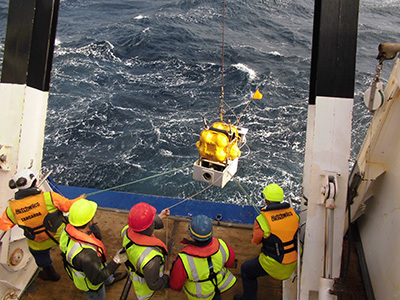 The discovery was made by conducting the first-ever detailed investigation of centimeter-level seafloor movement at an offshore subduction zone. According to Schwartz, the demonstration that pressure sensors on the seafloor can be used to accurately measure the deformation associated with slow-slip events is an important proof of concept. "The ultimate goal is to map the mechanical properties of the shallow plate interface and understand what areas have the potential to slip in ways that produce damaging earthquakes, tsunami-generating earthquakes, or slow slip," she said.